Cold March (2018. 362 pages) is the second novel in the Cold Maker Saga, written by Daniel A. Cohen. 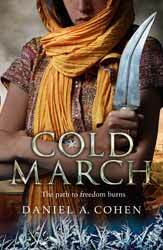 I quite liked the first novel Coldmaker (2017) and gave it a very reasonable score for a first time novel. So, now we have the chance to see how, or if, Cohen can build on that initial success. Having escaped the city I had hoped that Cohen would take the opportunity to expand upon the idea of this permanently arid planet where ice exists in many small forms. This time around, rather than being perplex at how the natural forms of cold exist and are used, I thought it better just to go along with the conceit. So, Micha, a Jadan slave with a genius level of engineering skills, Cam a former nobleman and Shilah, also a Jadan slave, after a series of adventure in the first book find themselves on the run. More important than that, they are on the run with the only machine which can create ice on demand. It is a machine which holds the potential of breaking the Khat’s monopoly on power and changing the planet back into a free paradise. The world building is never as good as it should have been. True we are introduced to various new characters, some which aid our young adventurers and some that inhibit, but at the end of the day you can’t get past the fact that, plot wise, this nearly completely consists of the group getting captured and escaping. There are some intriguing points, like the treasure store of the shepherd which teases a whole panoramic backstory, but this is quickly and quietly passed by. Worse still is the fact that Cohen has so quickly fallen back into using a pretty old and overused trope of having Micha turn out to be some sort of destined saviour. You know the plot, so unless the author has something up their sleeves; we all know where this is going. Likewise, I do not think that the use of their ice maker rose much above a dues ex machina. You need a door, bang there you go. How about a bridge or a boat? At times it did feel that it mostly existed to get the author rather than the characters out of a difficult position. Cohen still writes well and this being the second of three, its main job was to move the characters into their penultimate positions for the upcoming denouement, which it succeeds in. Hopefully, Cohen has something unexpected and novel for the last book.